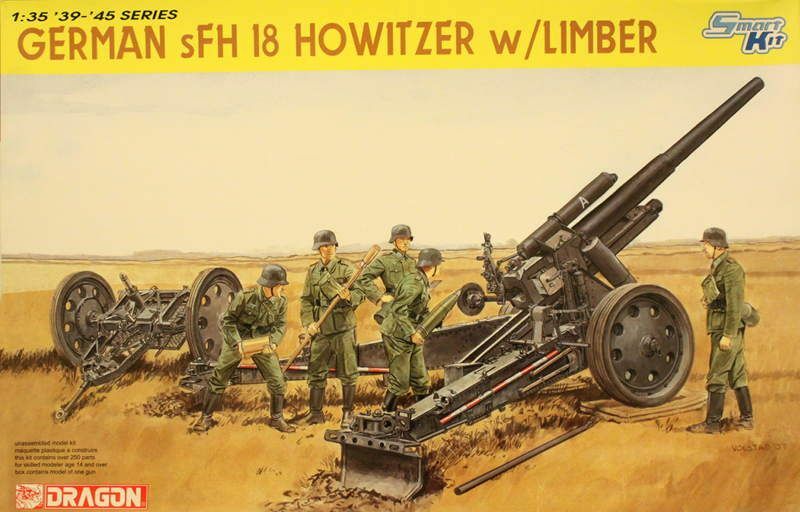 Armorama :: Problem with sFH 18 "little red&white poles"
Problem with sFH 18 "little red&white poles"
I am probably opening a can of worms and/or kicking a hornet's nest to bring this up and if it has already been posted elsewhere on this site I apologize. Also I would have posted this sooner but I just discovered it last night! Sorry. There is a problem with "the little red & white poles" (Aiming Stakes) on both the Trumpeter and the Dragon kits. Both manufacturer's painting instructions tell you to PAINT THE WRONG POLES red & white. Interestingly enough however the Dragon box cover art GETS IT RIGHT! On the Dragon cover art the CORRECT poles are shown in red & white but NOT on the instruction sheet! 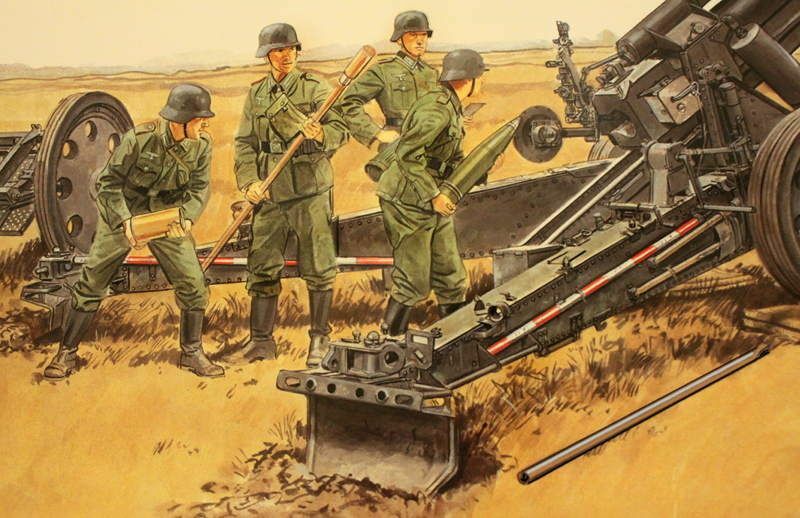 In the cover art the heavier leverage poles used for setting up and moving the gun around can be seen laying on the ground and they are to be painted the same color as the gun carriage. The smaller aiming stakes, which actually do double duty as being also the barrel cleaning rods, are the ones to be painted red & white. 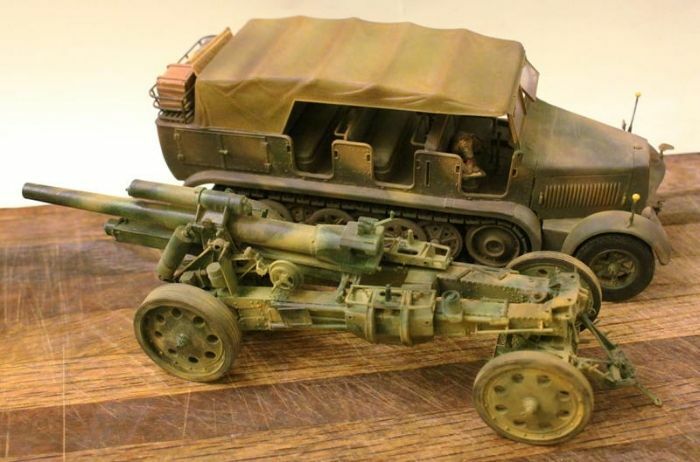 A quick check of the internet shows the majority of sFH 18 models (at least in 1/35th scale) seem to have been built incorrectly. One only has to consult the publication Allied-Axis #30 to find clear reference photos showing the use of the larger, heavier leverage poles. We see in the period photos the larger gray poles are being used to move the gun while the smaller red & white aiming stakes are still attached to the trails as they are not yet needed in the set-up process. 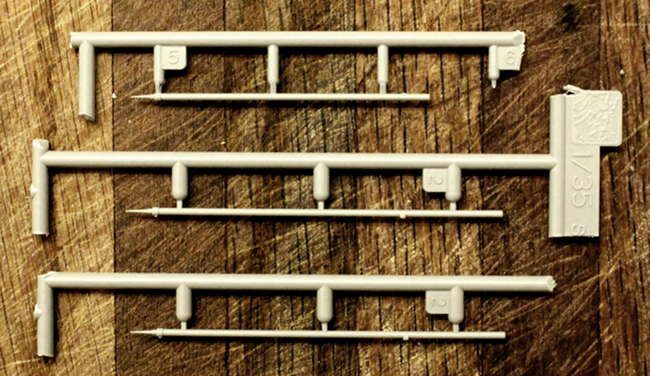 Here are the three aiming stakes in the dragon kit - identified as parts D2, D2, & B5. I am sorry but I cannot show you the leverage poles as mine are already installed on my model - identified in the Dragon kit as parts D7 & D7. The leverage poles are easily differentiated in that they have a somewhat odd looking squarish hook on one end whereas the aiming stakes have a sharp point on one end. The leverage poles can be seen hanging just below the spades along the top edge of the trails. Mine is almost finished. It only lacks the aiming stakes, the optics, the limber safety chains, a taillight and the air brake lines. You think the instructions may have been revised at some point? I don't recall that being an issue when I built mine. 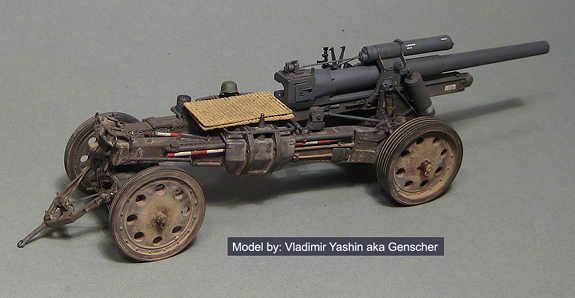 I also didn't notice an issue with those parts being switched that was mentioned in the Artillery thread. I cannot speak to that - I will admit my copy of the kit has been sitting in my stash for a number of years now! The current kits MAY have been corrected. With the Dragon offering I had problems with incorrect part numbers, a construction drawing being upside down, two "either-or" drawings not being labeled as such and the aiming stakes paint problem. However Angel said that his Trumpeter kit had the same problem regarding the painting of the aiming stakes. I checked the Dragon website. It said the kit had not been updated since its' introduction in October of 2007. Not sure that actually proves they didn't correct the instruction sheet with the next inventory run. Wait a minute! Faulty Dragon instructions? No! It couldn't be so! I can only second Mike in what he found out.Trumpeter painting instructions on both the sFH 18 and sK. 18 kits are wrong for the parts that need white-red stripes. So I'll repair the paint on my sFH 18 and have informed a modelling buddy of mine, who did the sK 18, to repair his gun accordingly. Guys, I can only say that I am sorry to be the bearer of sad tidings. To be honest, I don't think I actually looked at the kit paint guide. I think I just painted it the way I thought it should be based on other builds I've done.